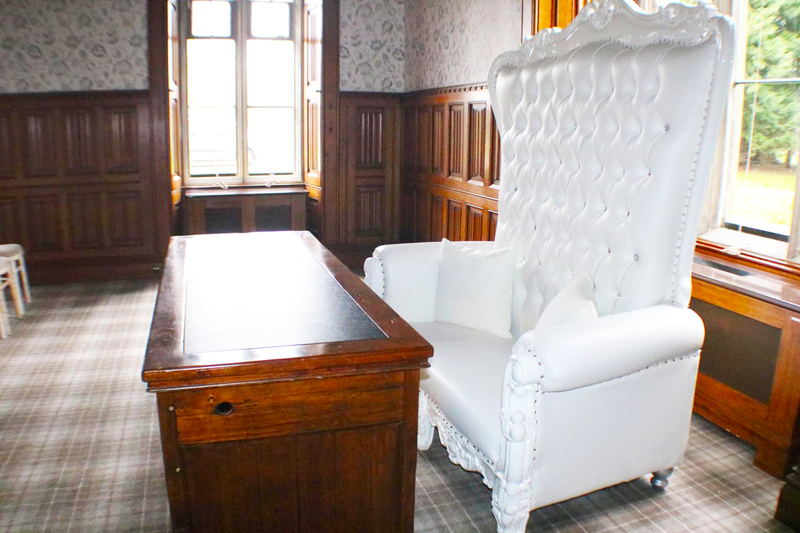 As part of our wedding throne hire service, we have both single and double seat thrones. 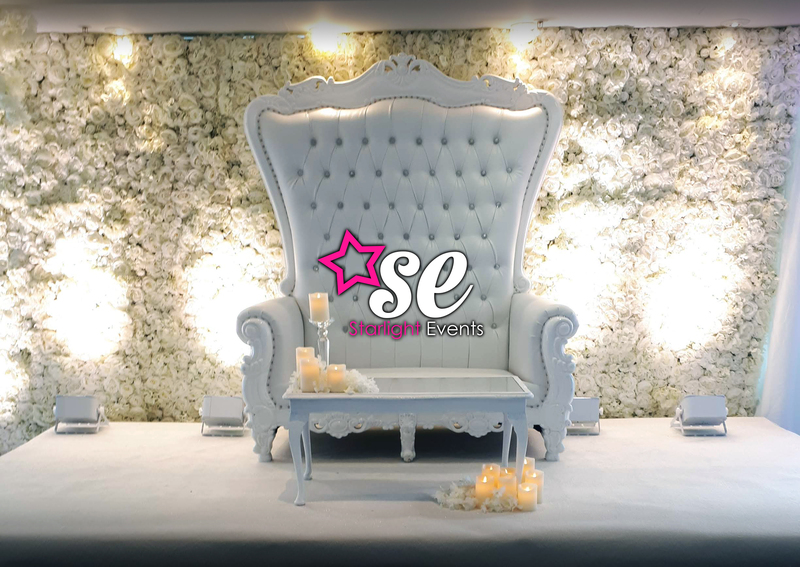 Our white wedding thrones are beautiful and INCREDIBLY comfortable. They stand 180cm tall (6ft) and really are the centrepiece of the room. As can be seen below, adding one of our flower walls completes the look. We have a range of clients who book these wedding thrones, they are either looking for something beautiful to add to their theme or they like the idea of appearing as King and Queen for the day and appreciate their guests will find them just as much fun! 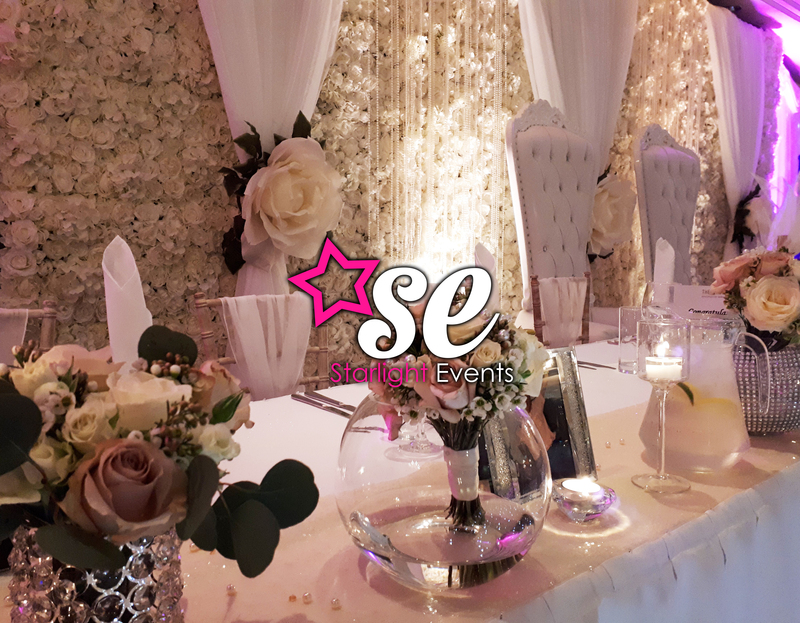 Either way, our clients who book our wedding thrones do so as it allows them to extend their personality to the decoration of the room. 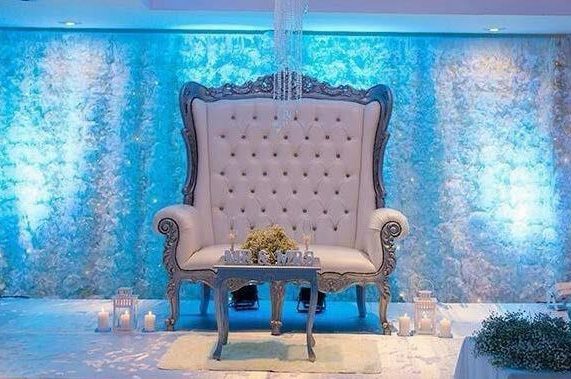 We will deliver your thrones and either set them up for you prior to your wedding ceremony. 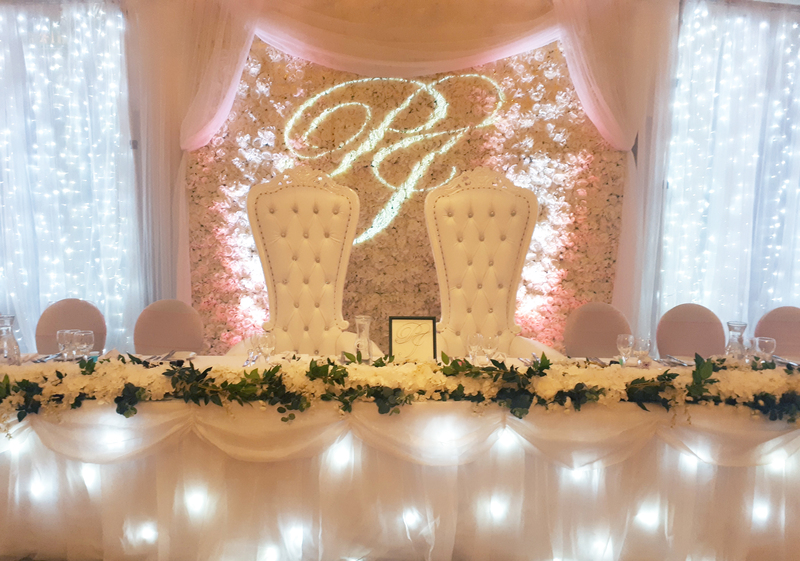 If you are getting married at a different venue, we will deliver your thrones to your venue and place them behind your top table. 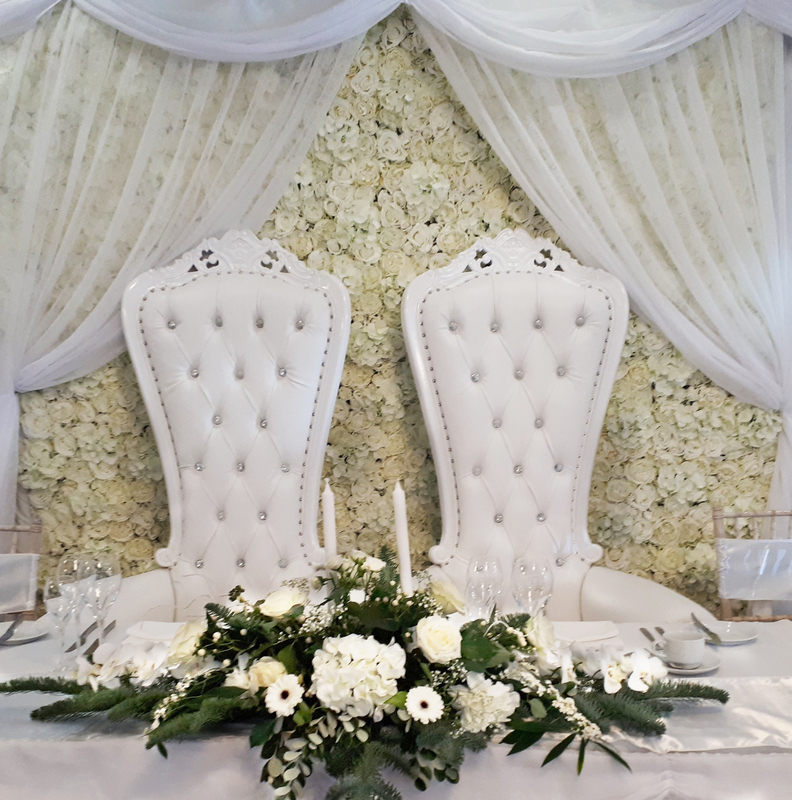 Our double seat wedding throne hire is a suitable addition to any top table as there are no restricting side walls. This allows those sat on it to be seen by all in the room while being sat together on a single extra wide throne. Please remember when using our wedding throne hire, that you’ll need a bit more space for these over our standard chair selection as they have more depth and width. You should allow for 1 less space on your top table when adding the thrones, so you have the option to make your top table longer or remove one guest. If this isn’t going to be suitable or you simply want to see what other chair options we have, please visit the page dedicated to Chiavari Chair Hire. The majority of the photos on this page were taken at the beautiful Hensol Castle https://www.hensolcastle.com/ which is situated just a few miles from Cardiff city centre.